In mixer add egg, butter, brown sugar, honey, and vanilla and mix on med. until well combined. In separate bowl, sift together flour, baking soda, salt, and cinnamon. Set aside. Roughly chop Snickers bars until in small pieces. Your zucchini should be one cup after it is drained. (mostly dry) I find that finely shredding up two cups typically yields one cup of drained zucchini. With mixer on low, add flour mixture to sugar mixture and mix until just combined. Remove bowl from mixer and fold in Snickers and zucchini by hand. I used a 1/4 cup measuring spoon for the cookies and placed them on a parchment lined cookie sheet. If you want to drizzle the cookies with chocolate, simply melt chips in a plastic pastry bag in thirty second intervals. 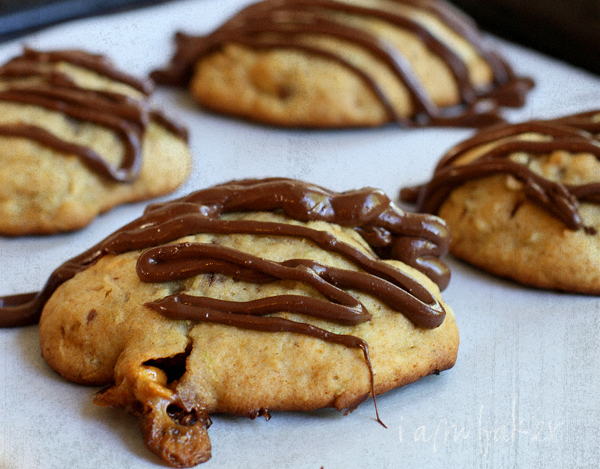 After chocolate is melted, cut off tip to the bag and drizzle over cookies. In my original recipe I only added two Snickers bars, but I thought they needed more. So I then decided to add up to four. However, its very difficult to identify these cookies as zucchini based at that point, as they just taste awesomely sweet. If you are a purist and want a clean flavor, stick with two chopped up bars. Working with very chilled Snickers bars is best. Please check out this blog…BEAUTIFUL! We love to hear from you! If you’ve got a great recipe to share, have a question or comment, please leave a message below, or email Vicki Adrian at vicki@adriansboutique.com.